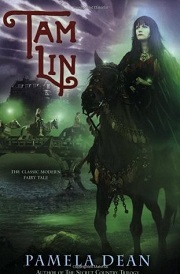 Pamela Dean’s retelling of the Scottish ballad Tam Lin is set at a Minnesota college in the 1970s. Janet, whose father teachers at the college, is beginning her studies there when she and her roommates, Tina and Molly, become involved with a tight-knit group of classics majors, Nick, Thomas, and Robin. And various interpersonal dramas ensue, just as it does in college. The book is over 400 pages long, and most of it just involves the characters moving around each other. Because Dean takes so much time getting to the ballad, the relationships, rather than the mythology, become the central point of the story. I think a case could be made that the establishing to details of these relationships goes on too long, but I enjoyed seeing how the characters evolved over their college years. And it makes the realization of what’s going on all the more shattering for Janet. The ending, when it comes, happens quickly, with Janet understanding her situation and having to make an almost immediate decision. And there are just enough questions left at the end to leave readers with a sense of both relief and unease. I liked that about it, too. 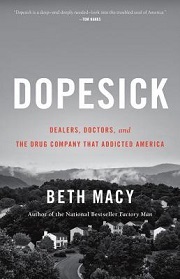 The opioid crisis has made many headlines, but I hadn’t wrapped my head around how serious the problem is until reading this excellent book by Beth Macy. Macy has been a reporter in Roanoke, Virginia, for decades. (In fact, I took a couple of writing classes that she taught when I lived in Roanoke, and she encouraged me to take up writing myself — encouragement that led to my first and only newspaper job.) Much of the book looks at how opioids — in the form of Oxycontin and other prescription drugs and then heroin — took over the Appalachian communities of western Virginia and eventually made their way through the Shenandoah Valley and into some of the wealthiest communities in Roanoke. The crisis has been going on in coal country since the late 90s, almost immediately after Oxycontin was introduced. Aggressive pharmaceutical marketing led doctors to prescribe the potent painkillers, having been told they were safe, and patients quickly got hooked. When they tried to stop, they got “dopesick.” The pain of withdrawal led to reckless behavior, such as injecting drugs to get a more potent high and turning to heroin when the pills ran out. And the depressed economy made selling pills an appealing prospect, and crime went up as people stole pills and valuables that allowed them to buy more pills. The community was transformed. Doctors and law enforcement sounded the alarm right away, but, of course, it didn’t become a headline-making national crisis until it reached the suburbs. In Roanoke, wealthy and upper-middle-class kids started taking the pills, and their families didn’t understand what was happening until it was too late. Or, if they did understand, they were too ashamed to speak up. Eventually, though, a community of families touched by opioids forms, and Macy follows their struggles with grief over lives lost and drive to help those who are still alive but trying to kick the addiction. It’s a grim picture, and Macy takes a hard look at why so many of the current solutions aren’t working. The get-tough tactics are just filling jails, taking people away from communities of support. And abstinence-only recovery programs force those who are addicted into painful withdrawals, when medication-assisted treatment could ease recovery. Yet, even if abstinence-only programs are effective, they, like all recovery programs, are ridiculously hard to get into. Seeing the struggle suburban families faced getting help made me even more heartsick for the poor rural people trying to get clean. Issues of politics and race sit at the edges of the story. The opioid crisis is more of a white problem (partly because doctors have been less likely to trust black patients with these prescriptions), but there are some common threads between the response to opioids in poor white communities and the war on drugs in black inner-city communities. And reading about the problem made me feel compassion toward the folks who were so desperate that they’d vote for anyone who offered some sort of change, even if what he offered was a lie (which it was). And Macy highlights the heroes who have been fighting the good fight in Appalachia for decades. If you want to understand the crisis, this is a great place to start. This 1974 novel by D.G. Compton is set in a near-future time period, when death by disease has been pretty much eradicated, leaving people to die of accident or old age. When a person does develop a terminal disease, they become figures of great public and media interest because, apparently, the world has become so starved of suffering that they feel a need to vicariously experience others’ suffering through the media. As the novel begins, Katherine Mortenhoe learns that she has a rare disease of the brain, a sort of information overload, combined with what her doctor calls “outrage.” Over the next weeks, the overload will cause her body to gradually cease functioning. Of course, her case is of intense interest to the media, and Roddie, a television reporter who recently was given implants that turned him into a living camera, is assigned by the network NTV to follow Katherine and, once she’s signed the appropriate forms, record her story for television. As Katherine goes through her final days, she realizes that she doesn’t want to live out her time in the way that seems laid out before her. Her marriage was on the verge of its five-year renewal, and she had every intention of staying with her husband, if he would have her, but the calculus has changed. So she sets a plan in motion, and, unbeknownst to her, Roddie is following close behind. Compton has built a pretty convincing world, especially given that this book was written well over 40 years ago. It all still feels plausible (with some tweaks to account for changes in technology) and some of it feels remarkably prescient. Even Roddie’s built-in cyborg camera, probably the most preposterous element, doesn’t feel too far away from our constant phones with cameras. But the story isn’t really about all these technological, medical, and media advancements, nor is it (as I thought it might be) about constant media-induced rage. It’s more about lack of human connection and the transformative power of such connections when they occur. The relationships in the book are contractual and impermanent, not so much about affection or love. Yet people continue to long for love and connection, without knowing that’s what they long for. This being the case, I sort of wish Katherine and Roddie had been more interesting characters so that I would want to spend time with them as people. But, as it is, they are just vehicles for the story, which I often enjoyed but didn’t love. There is a revelation toward the end that changes the shape of the entire story, but that thread is never really pursued. It feels like it’s just there to ramp up the tragedy, as well as the venality of the television executives, willing to do whatever they want for ratings. That drive for ratings (or clicks), without the human connection, is part and parcel of the problem the book is exploring, and I would have liked to see the issue teased out a little more. Still, by just leaving it as it is, the book avoids heavy didacticism, and I appreciated that about it, so perhaps Compton knew what he was doing. 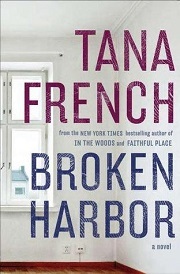 I continue to love Tana French’s Dublin Murder Squad series, and Broken Harbor, the fourth book, may be my favorite yet. It felt a little leaner than previous books, and the murder at its heart is particularly disturbing. Plus, it explores lots of good questions about luck and fate and control. Each book focuses on a different member of the Dublin police force as they attempt to solve a murder that usually ties in some way to the detective’s own past. In this case, the detective is Mick “Scorcher” Kennedy, the straight-laced rule-follower who antagonized Frank Mackey in Faithful Place. The murder involves a family of four — two children, apparently suffocated in their beds, and their parents, both of them beaten and stabbed in their kitchen. The mother, Jenny Spain, is the only survivor, and her injuries are so severe that she may not live long. Because there was no sign of forced entry, suspicion of course lands on the father, Patrick Spain. But there’s plenty that doesn’t add up. What happened to the murder weapons? And why are there so many holes in the walls? And what’s with the video monitors scattered through the house? The Spains live in a newly built community called Broken Harbor. Most of the houses were still under construction when the housing crash happened, and so the development if filled with incomplete homes and few neighbors. That houses that do exist are shoddily constructed. All of this adds a level of creepiness to the story. Scorcher has ties to Broken Harbor, as his family vacationed in a caravan there before his mother died by suicide. And, as he works the case, he has to help his sister work through a difficult period managing her own mental illness. In addition, Scorcher has a new partner, a rookie named Richie Curran. Scorcher generally has no use for partners and sees his role as getting his new charge on the right path, while he makes all the decisions. But he finds that Richie has certain knacks that he lacks, and Scorcher finds himself getting attached. One of Scorcher’s mantras is that the simplest solution is usually the right one. But none of the solutions to this crime seem simple. And when Scorcher lands on a culprit, Richie senses that the solution he’s found is too simple. Much of their debate ends up circling around issues of social class and people’s ability to control their own destiny. Scorcher is convinced that following the rules will get you to the right place in the end, but Richie isn’t so sure. And their different mindsets lead them in different directions regarding the crime. I have to admit, I was extremely fond of Richie and spent a lot of the book worried for him. (Whether my fears were justified, and my opinion of Richie in the end, I’ll leave to myself.) Scorcher was just a little too confident for me to warm up to. It’s not that I don’t appreciate a rule follower (I’m one myself!) but Scorcher’s rule following ends up looking too much like rigidity and judgmentalism. 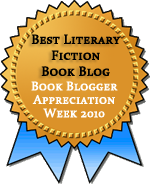 By the end of the book, I appreciated his attitude more, partly because I saw it being shaken. And partly because I grew to understand that he was trying to find his own way to hold back chaos. The solution to the crime was particularly disturbing, with lots of chaos to hold back. It’s a book that shows how the mind doesn’t always follow the rules and how, sometimes, real justice is impossible to find. Anyone who saw me spitting on the picture might think I knew that particular man personally. But I did not. I am just one woman. And there is no single woman who could possibly know all the men who get their pictures published in the newspapers. For after all, I was only a successful prostitute. And no matter how successful a prostitute is, she cannot get to know all the man, However, all the men I did get to know, every single man of them, has filled me with but one desire: to lift my hand and bring it smashing down on his face. Firdaus is telling her story to a psychiatrist who was interested to hear of Firdaus’s calm demeanor and her refusal to sign a request that her sentence be commuted from death to life imprisonment. She tells a story of a life where men controlled every aspect of her existence, from where she lived to where she went to school to who she married to what she did with her body. The closest thing to freedom she managed to find was life as a prostitute because she was able to earn her own money and was successful enough to be able to say no to clients she didn’t like the look of. But, even there, she was vulnerable to men. The story shows how systemic injustice can lead a person to despise an entire group of people for their role in the injustice. Firdaus didn’t start out hating men. But after being treated badly by them again and again, in many different ways, she has no reason to feel anything but resentment and anger toward men in general. To do anything else is unsafe. Her narration shows a woman who wants to be happy, who had dreams and desires, who loved to learn and was willing to work. But in a world controlled by men, she has no opportunity for freedom. And so she’s quiet in her cell, waiting for her execution. This is a short book, and a hard story to read. I’ve been thinking a lot about anger, specifically women’s anger, the past couple of weeks, and this was a compelling exploration of the topic. Firdaus speaks with such clarity and sincerity that it’s impossible not to be on her side and to feel anger at all the ways she’s been wronged. Her case is an extreme one, but it’s not unique. Nor is it confined to 1970s Egypt. I read part of Rebecca Traister’s book Good and Mad this week (although I gave it up because it’s too focused on recent history) and have watched a couple of episodes of the new documentary about Lorena Bobbitt, and this story fits right with those. Pinch Bavinsky, the title character in Tom Rachman’s latest novel, is the son of artist Bear Bavinsky. Born in 1950s Italy, Pinch remembers Bear as a big personality when he moved in with Pinch and his mother, Natalie, a fledgling potter. But Bear’s residence with Natalie and Pinch was brief. Soon, he was off to a new wife and children, and then another, and another. Always on to another place, where he became the center of all activity and everyone accepted his whims and anxieties. Because he’s an artist and needs everyone to be sensitive to him. Still, throughout his life, Pinch sought his father’s attention and approval. As an adolescent, he took up painting and his mother believed he had talent, but it was Bear’s approval that mattered. The same when he had his first girlfriend or tried his hand at art criticism. Part of him seemed to understand that Bear was terrible, but that didn’t matter. 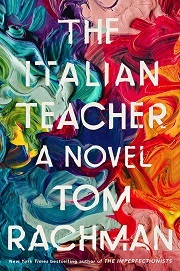 Eventually, he’s able to settle only when he chooses a life far from his father’s interests, by becoming an Italian teacher. But that’s never his passion. He’s still haunted by the need to follow Bear, somehow. It took me a while to warm up to this book. All of the characters are terrible in one way or another, but Bear most of all. And it was painful to see Pinch and everyone else kowtowing to Bear’s desires. It’s well-written and everything, but, ugh, so painful. And stories of brilliant male assholes being catered to by everyone are just pretty much off the menu for me. But then, about halfway through, the book takes a turn and becomes much more interesting. Pinch makes a choice that puts him in direct contradiction with anything Bear would want, but he manages to keep it a secret. And after his father’s death, he keeps finding other ways to secretly subvert his father’s wishes. It’s liberating in a way, but it also keeps Pinch thoroughly in Bear’s shadow. This move adds an element of much-needed suspense, as well as complicated questions about the relationship between art and artists. 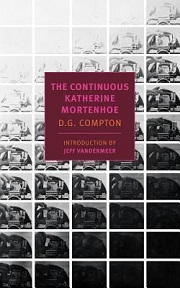 Rachman also uses this plot development to satirize the world of art criticism and the way judgments are as much about money and reputation as about actual artistic merit. The whole thing ends up being a lot of fun. 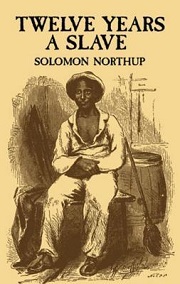 Solomon Northup was a free black man who lived his whole life in New York until, in 1841, he took a job as a traveling musician. This job landed him in Washington, DC, where, despite possessing papers showing he was a free man, he was kidnapped and sold into slavery. None of his captors believed his story (or so they claimed), and he was sent to New Orleans, where he was enslaved for 12 years. This book is his memoir of those years. I became familiar with this story from the 2013 movie, and, although I don’t recall a lot of the details from the film, the general outlines of the two versions are the same. During his 12 years in Louisiana, Solomon is held as a slave by three different men, one of whom is relatively decent (as slave owners go) and the other of whom are cruel. He keeps his background a secret, having learned early on in his captivity that revealing his free status could put him in even greater danger than he already faced. Northup writes in a straightforward manner, giving readers a sense of what day-to-day life was like for him and other slaves and also making note of the most dramatic events, such as the time when he was almost lynched for fighting back. It is, of course, a painful story, made bearable partly because as readers we know he survived. It is not the fault of the slaveholder that he is cruel, so much as it is the fault of the system under which he lives. He cannot withstand the influence of habit and associations that surround him. Taught from earliest childhood, by all that he sees and hears, that the rod is for the slave’s back, he will not be apt to change his opinions in maturer years. The system had “a tendency to brutalize the humane and finer feelings” of slaveowners’ nature, leading them to devalue human life and ignore human suffering right in front of them. Part of me reads this as making excuses to appease a white audience, but I also think it’s true that we are all part of a system that tries to keep us from seeing certain realities. That’s something that’s been on my mind a lot in recent weeks, as the past and present racism in my own state of Virginia has made national headlines. People sometimes do racist things out of ignorance. I find that hard to stomach when it comes to slavery, which is so obviously wrong, but I know I’ve had other, less obvious areas of ignorance. And so it’s important to look at what the system as a whole is teaching us. What message, for example, do our immigration policies send? Or our school funding formulas? Or our health care systems? What toxic opinions are we embedding in ourselves and our young people that will be difficult to extricate in the future? What he did, what I want to do, is to document Indian stories in Oakland. I want to put a camera in front of them, video, audio, I’ll transcribe it while they talk if they want, let them write, every kind of story I can collect, let them tell their stories with no one else there, with no direction or manipulation or agenda. I want them to be able to say they they want. Let the content direct the vision. There are so many stories here. This book feels a little like that project in novel form. It’s the story of urban Indians in Oakland. Each chapter follows a different character, with Oakland seeming, for much of the book, to be their only commonality. They come from different tribes, if they are enrolled in a tribe at all. They are from different generations and have different experiences, although many have experienced some sort of trauma — a lost parent or a lost child or addiction or homelessness. These aren’t necessarily their own stories as they would tell them. Some chapters are in first person, but most are in third. (And they have a similar tone, which makes it sometimes hard to keep characters straight as the story expands.) 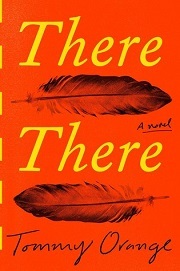 But the book has that feeling that Dene describes, of being every kind of story, simply told with no clear agenda. As the book goes on, all the stories converge on a single event, the Big Oakland Powwow. Some characters are helping organize the event. One of my favorite characters, Orvil Red Feather, is preparing to dance at the powwow for the first time, having taught himself secretly by watching YouTube videos, as his adopted grandmother (really, his great aunt) has been too busy working to keep the family fed to connect him with Indian traditions. I would have read a whole book about Orvil and his family. This is a good book, well-written and engaging throughout. For me, there were a few too many characters. There’s a whole plot involving a robbery that could have been simplified. As it was, I didn’t care enough about the characters in that plot to feel invested in its outcome, aside from how it touched other characters that I did care about. And I did care about most of the characters. I appreciated the way Orange had certain themes echo across lives, while giving each character their own story. I think it’s likely to do well in the Tournament of Books and even has a good shot at the rooster — better than my own favorites, which have qualities that are likely to irritate some readers. That’s not the case here. This is a solid and interesting read, especially for a first-time author. 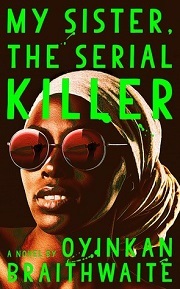 My Tournament of Books reading continues with a dark and twisted and really enjoyable crime novel by Oyinkan Braithwaite. It doesn’t surpass Washington Black or So Lucky as top contenders, but it’s near the top, alongside Milkman. The narrator of My Sister, the Serial Killer is a nurse named Korede, and her sister, Ayoola, is indeed a serial killer. As the book begins, Ayoola has just summoned Korede to help her clean up and dispose of the body after her third kill. In each case, she claims she was being attacked and had to defend herself. By the third time, Korede is having her doubts. It doesn’t help that Ayoola is absolutely gorgeous and finds it easy to win men’s affections and convince both men and women to do what she wants, while Korede has to work hard to get any sort of attention or respect — or at least that’s how Korede feels. Ayoola has experienced her own suffering, and Korede knows that. It’s probably one of the reasons she’s so quick to protect her. The situation becomes complicated when Ayoola meets Tade, a handsome doctor at the hospital where Korede works. Korede has been secretly in love with Tade for some time, but her hopes are dashed when Tade becomes instantly smitten with Ayoola. Korede is now worried for Tade, and also more than a little resentful of Ayoola. The book moves quickly, in short chapters, always in Korede’s head. There are some flashbacks to past killings and past trauma. And a picture And while the book provides reasons for Ayoola’s violence and Korede’s loyalty, as well as her resentment, it doesn’t excuse either woman. They are doing bad things, for psychologically comprehensible reasons. The plot gets more complex as it goes, and by the end, Korede’s situation is looking even more untenable. Yet there’s a sense of patterns continuing, always. This 1912 novel by E.F. Benson focuses on the people of a little English town who don’t seem to have much to do except to watch each other and gossip about who is dining with whom and when. 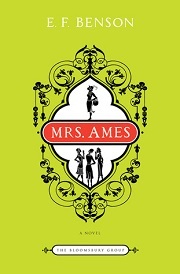 Mrs. Ames (Amy) starts off a big round of gossip when she decides to host a dinner party at which certain wives and husbands of the town are invited to come without their spouses, allowing for, she hopes, more lively conversation. It turns out that her own husband, Lyndhurst, becomes caught up in attraction to Millie Evans, his wife’s young and attractive cousin. Her doctor husband is often busy with his work, leaving her on her own, and so she soaks up Lyndhurst’s attention. It’s all very innocent, at least at first, but Mrs. Ames is suspicious and decides to do what she can to maintain her husband’s interest. I haven’t read Benson’s Mapp and Lucia books, but my understanding is that they’re light stories about social rivalries and ambitions, and that’s what this book is as well. But it’s also getting at some interesting ideas about the role of women and the bonds of marriage. Amy Ames is about 10 years older than her husband, and her age causes her considerable consternation, even though she appears to be in better health than he is. When a young and attractive rival shows up, the only thing she sees to do at first is to try to make herself look younger, coloring her hair and treating her skin, both of which open herself up to gossip. But so much of her life is about seeking the attention and affection of other people, especially her husband. What else can she do when she sees her husband’s affections drifting away, leaving her open to ridicule and even more vicious gossip. She had taken so much trouble with so paltry a purpose. And yet that innocent and natural coquetry was not quite dead in her; no woman’s heart need be so old that it no longer cares whether she is pleasing in her husband’s eyes. Only today, it seemed to Mrs Ames that her pains had been as disproportionate to her purpose as they had been to its result; now she longed to take pains for a purpose that was somewhat deeper than that for which she softened her wrinkles and refreshed the color of her hair. 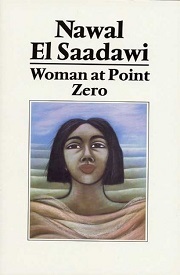 In the end, though, this is not a book about a woman finding a new purpose through political action. Instead, political action and the strength she found in speaking up in that arena enables her to find the strength to speak up for her own marriage. So the narrative neither exactly endorses nor rejects the cause of women’s suffrage. It’s not a main concern of the narrative — more of a means to an end. But, in 1912, that might not be so bad.